William Bryan Henn was born on 22nd October 1917 in Dublin. He must have joined one of the prewar flying training schemes as he is recorded as as receiving his Air Certificate at 10 E&RFTS Yatesbury on 21st November 1938.He joined the RAFVR in October 1939 as an Airman u/t Pilot. After completing his training he joined No. 1 AACU. 501 Squadron – Henn went to 5 OTU Aston Down on 3rd August 1940. After converting to Hurricanes he joined 501 Squadron at Gravesend on 19th August and flew his first sortie on the 21st. Henn claimed a He111 destroyed on 30th August. 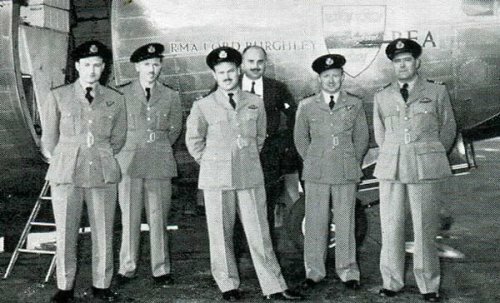 Above: Henn, bearded, is standing second from left. The image is via ‘Croydon to Concorde’ by Captain RE Gillman and was taken at Blackbushe in the 1950s following a diversion because of fog in London. He was wounded on 2nd September after which he lost his operational flying category. Its unclear what happened as the ORB shows him flying Hurricane P3803 which had been lost on 12th August but other sources have him being badly burned. He did not fly again with 501 until 17th December 1940. Henn was later posted to Alberta, Canada as a flying instructor. Commissioned in September 1942, he returned to England in 1943 and went to RAF Transport Command, still as a flying instructor. Awarded the AFC (gazetted 1st January 1945), Henn was released from the RAF in 1947 as a Flight Lieutenant. 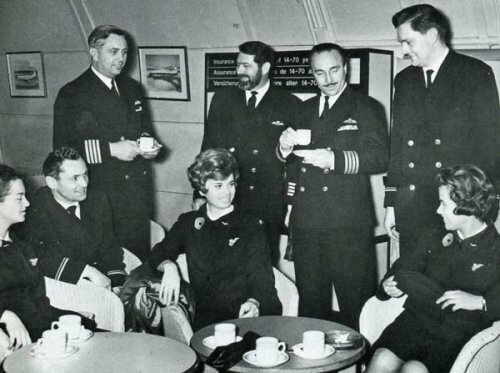 He joined BEA as a Captain, retired in 1968 and then joined the Civil Aviation Authority as Flight Operations Inspector. Below: Henn operated the first BEA Elizabethan service between Manchester and Dusseldorf on 6th October 1953. All images courtesy of Jim Davies and Keith Hayward of BA Heritage Centre.